The aerospace industry is one of the most competitive industries. Cost reduction is not an option it is a necessity. Boeing is doing everything to stay competitive; this includes collaborating with suppliers as well as introducing more automation technology into manufacturing. In recent years, there has been a major demand for new aircraft around the globe. This demand has created a huge order backlog that has yet to be fulfilled. Companies like FedEx are looking to phase out their old fuel inefficient aircrafts for more efficient aircrafts like Boeing's 767. As a result, FedEx has placed an order for 50 (or more) new 767s; this will make FedEx one of Boeing’s largest customers. This represents the backlog for one client. Boeings total backlog encompasses 5,600 plane orders, with a cumulative worth of $426 billion. Fulfilling an order backlog is not Boeing’s only problem. Boeing also has to compete with major players in the industry, such as Airbus. At this point, both companies’ order books are full. What will determine the future success of these companies is how quickly they are able to manufacture and deliver new aircraft. If Boeing wants to meet demand, it will have to innovate its manufacturing processes as well as augment its supply chain. Boeing’s continuous improvement approach towards manufacturing has allowed it to become a global leader in aeronautical design. Boeing is taking a completely new approach to designing the fuselages for its commercial airliners, specifically for its 777 and 787 models. Boeing refers to the new manufacturing process as the Fuselage Automated Upright Build, or (FAUB) for short. Through the implementation of automated guided robots, FAUB looks to improve workplace safety while simultaneously improving quality. 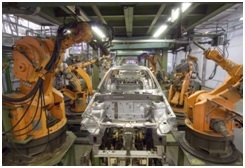 Automated robots like the KUKA, found in Tesla’ Motors Fremont California facility, utilize multi-joint robotics arms to drill and fill more than 60,000 fasteners on the Boeing 777. Automating fuselage assembly promises to decrease workplace injuries as well as decrease production time and costs significantly. Advanced Integration Technology (AIT) Inc, of Texas, developed the automated design process for the Boeing 787. AIT is a company that specializes in building manufacturing, tooling, and assembly systems for commercial and military aircraft. AIT used motion control systems, servo drive platforms, failsafe CPUs and distributed I/O, to develop a fully automated positioning and joining system, able to join the constituent components of the 787. The entire automated system communicates on a Profinet network, which essentially is industrial Ethernet for advanced manufacturing. Profinet is more advanced than conventional Ethernet. Profinet allows for the real-time performance needed for industrial IO, high precision determinism, and it is able to withstand harsh manufacturing environments. For example, dusty, hot, humid, corrosive, and even environments subject to strong electromagnetic interference (EMI). To comply with Boeing’s requirements AIT had to design two assembly systems and one positioning system. AIT’s automated systems encompasses 14 position components to lift the three main sections of the fuselage- section 41(forward fuselage), section 47/48(aft fuselage), and section 12(left and right side wings) during assembly. The positioners are mounted to transport structures that are able to move independently or interlocked. A GPS measurements system is implemented to determine the exact positioning of each section of the fuselage. Robotic arms are the most common manufacturing robots ; they are able to do heavy and repetitive manufacturing work. These robots are usually comprised of seven metal sections, connected by six joints. Robot arms have a computer that is able to move the machine with precision by activating the stepper motors found in each joint. Stepper motors are different from conventional motors because they are able to move in exact increments. This precision is crucial when drilling holes and fastening fasteners on the Boeing 777. One of the most important features of incorporating robotic arms into the manufacturing of fuselages is that these robots can be easily reprogrammed to perform many other functions besides the original tasks they were commissioned for. Boeing is making major capital investments to their 737 plant located in Renton, WA. With these investments in automation, Boeing is planning to increase the plant’s production rate to an unprecedented 52 jets per month. This increase in production capabilities will be needed so that Boeing can meet the 2,700-order backlog of the 737. Since the days of Henry Ford, the assembly line has been at the heart of manufacturing. The assembly line has allowed for increased production rates as well as quality assurance. For these reasons, Boeing has decided to increase the efficiency of manufacturing the 737 by implementing an assembly line approach. The 737 fuselage shells are supported by steel superstructures. This allows mechanics to install insulation blankets electrical wiring, metal hydraulic tubes, pumps, and many other components. What makes these steel structures particularly innovative is that they act like drawbridges. This enables the superstructures to move out of the way and allows for the fuselage to move forward freely on a sophisticated drive rail system. This is a very different approach compared to the conventional method of using a crane to lift the fuselage into a fixed support system. The rail system enables the fuselage to travel 150 feet forward into the next position. The assembly line approach prevents workers with different tasks from getting in the way of each other during the build process. Each time the fuselage moves down the assembly line it moves to a location where all the tools and resources for that phase of the manufacturing process are readily available. 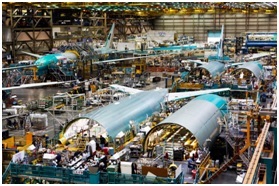 Boeing has also applied assembly line techniques to the back-end shops where the wings and other major aircraft components are made. Just five years ago, wing panels were held in place vertically as mechanics ran up and down staircases to manually conduct drilling. Boeing receives upper and lower wing panels from suppliers. These parts are really just shells though; they require a tremendous amount of drilling and machining before they are ready to be attached to the fuselage. Each aluminum wing-skin panel requires approximately 5,000 holes to be drilled. Upgrading the drilling machines used to drill these holes is another way that Boeing is speeding up production. The Renton plant currently uses drilling machines made by Gemcor, based in New York. This machine can drill and fasten 70 percent of the wing-panel holes; unfortunately, it cannot install bolts, which make up 10 percent of the fasteners on the wings. Boeing has decided to go with a drilling system created by Electroimpact Inc, based out of Mukileto, WA. 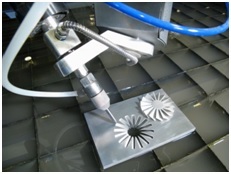 Electroimpact’s drilling system is able to drill 90 percent of the holes on the aluminum wing-skin panels; it is also capable of installing bolts. This new machine will allow Boeing to reduce the required shifts to tool the wing-skins from three shifts to two shifts. These new machines are able to work twice as fast as humans, with two-thirds fewer defects. The new Electromagnetic machine also allows for greater quality control. This machine uses hydraulic force to drive fasteners. This allows for a much quieter build process than the conventional hammer driven rivets of the Gemcor machine. This silence enables machine operators to hear unusual sounds during the fastening process. These unusual sounds can be a clue that something is going wrong during the fastening process. Boeing’s current 5,600-plane backlog represents a tremendous volume of sales and future revenue to be collected; it also represents an opportunity for Boeing to improve its manufacturing process as well as its supply chain. In reality, though, improving manufacturing processes and its supply chain is more of a necessity than an opportunity for Boeing. These increased margins now will be an excellent way to hedge against a potential future where the global economy experiences slower than average growth. The way Boeing plans to increase margins is to work with and encourage their approximately 21,000 suppliers and partners to innovate and improve their manufacturing practices. These improvements will require massive amounts of research and development. All this research and development can be costly, but it is an investment that will allow these suppliers to manufacture products more efficiently and will allow them to stay competitive in the years to come. Boeing suppliers that improve their manufacturing processes are eligible to apply for the permanent R&D tax credit. This credit is an excellent way for Boeing’s suppliers to offset the cost associated with improving their manufacturing process. What is interesting about Boeing’s complex supply chain is that Boeing is not the only one pressuring its suppliers to innovate. First tier suppliers like GE and United Technologies, who are leaders in jet engine manufacturing, are putting pressure on second tier suppliers to innovate. First tier suppliers are also trying to increase their profit margin. This means that second tier supplier need to become more efficient. If second tier suppliers do not make capital investments in advancing their manufacturing processes, they could run the risk of losing the business of first tier suppliers or even being bought out by the first tier suppliers. “The average age of a highly skilled factory worker in the in the U.S is now 56.” This is alarming for companies operating in the United States’ high-tech manufacturing sector, especially companies like Boeing. Boeing and its suppliers are expecting a major shortage of skilled workers in the years to come as the majority of highly skilled factory workers are expected to retire. This means that all these workers need to be replaced somehow. Automation and the use of highly sophisticated manufacturing tools will be essential to overcome the future lack of skilled workers. There is expected to be a demand for 10 million skilled workers by 2020. Many high-end specialty machine shops are looking to supplement the lack of skilled labor with multifunctional programmable machine tools. Shops that integrate these more diverse machines are able to free up the time of their high-level employees. High skill workers can now focus more of their time on more technically demanding tasks instead of monotonous ones. Multifunctional automated machines are also desirable because they are able to run 24/7 on a lights out basis. This allows for a higher production volume and therefore a lower per unit cost. To increase efficiencies, Boeing relies on its suppliers of aircraft parts to innovate their production methods. Innovations in these suppliers’ manufacturing processes allow for cost and time savings. The integration of advanced machines, be it high end 5-axis CNC machines or 3D metal printers, will impose a steep learning curve on Boeing’s suppliers. Whenever a new piece of machinery is integrated into a supplier's manufacturing process there is a lot of uncertainty. Workers need to be educated on how to use the machine. The production process needs to be analyzed and redesigned to ensure that the new piece of machinery is being integrated in a way that will allow for the highest efficiency yield. New machines may force suppliers to code differently, use different tooling and cutters, and assemble parts differently. Other factors that can potentially come into play are harmonics, different horsepower curves, different accelerations, and decelerations. Every year Boeing recognizes suppliers that exceed Boeing customers’ expectations through quality, value creation, and teamwork. Boeing understands that its future success is intertwined with supplier performance and commitment to innovation. Boeing’s top suppliers are making extensive capital investments into their aerospace manufacturing capabilities. General Electric recently announced that it will invest $200 million in two aerospace facilities in Huntsville, Alabama. GE is also making significant investments into advancing 3D printing techniques such as direct laser melting. BAE is committed to developing aerospace technology. BAE recently announced that it will invest approximately $32 million in the U.K. based firm Reaction Engines. This will be a working partner and supplier partnership aimed at developing the next generation of aerospace engines. In October, Rolls-Royce announces that it will invest around $600 million to modernize manufacturing processes at its Indiana plant as well as increase its R&D capabilities. Spirit AeroSystems has announced that it will invest more than $100 million in automation technologies to increase production rates for Boeing aircraft. Many believe that within 10 years every commercial airplane will be partially comprised of 3D printed parts. The advent of 3D printing technology has allowed people to create and innovate at rates that were once thought impossible. 3D printing technology is still in its infancy and has predominantly been used for prototyping. The reason for this is that the cost to manufacture a part using 3D printing is linear; there are no economies of scale. However, the manufacturing of components for the aerospace and defense industries is a different case. This is because these components are constructed from very expensive materials, they are at the long tail of manufacturing, and they are highly experimental in nature, thus requiring the creation of multiple prototypes before a final design can be chosen. These conditions allow 3D printing to be an economical manufacturing technique that can yield substantial tax credits. The main advantages of 3D metal printing is that it allows for the creation of complex and innovative designs that would not be possible using conventional manufacturing techniques. 3D printing metal parts also allows for weight reduction while simultaneously increasing strength and durability. Additionally, there is the cost factor. 3D printing is an additive manufacturing process, this means that the part is built up layer by layer and not cut away from a larger piece of material. This means that the only material printed is the material that will be used in the final product. 3D printing is expected to completely revolutionize the aerospace and defense industry. Companies that implement 3D printing technology in the manufacturing of parts in the already innovative aerospace and defense industries will be eligible for R&D tax credits. The demand for aircraft is increasing at an unprecedented rate. The number of Boeing commercial airplanes in the world is expected to double with in the next 20 years . Many major aircraft manufactures like Boeing and its suppliers are in a scramble to fulfill backorders. This scramble has spurred large-scale investments aimed at speeding up manufacturing processes while simultaneously reducing their cost. Companies that participate in projects that improve the Boeing manufacturing processes could be eligible for substantial tax credits.